Andrew writes: I defrosted some drumsticks before leaving for work. 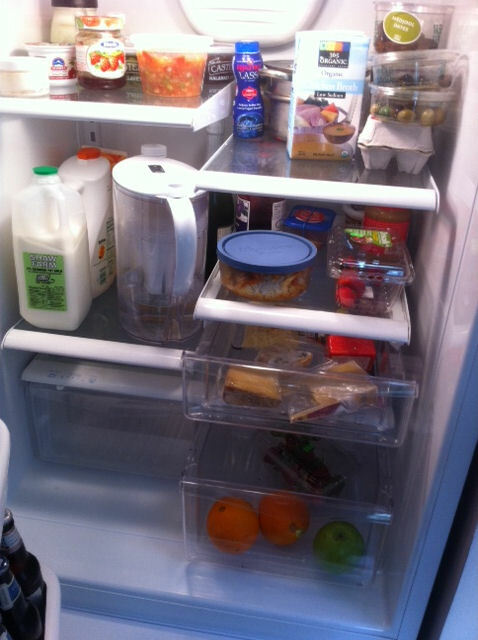 I also took this snapshot of the fridge (which is pretty bare). I’m wondering if dinner for the family is doable without making a pit stop at the market. Tony’s take: Andrew go straight home! You’re good. Those olives (top shelf) and oranges (vegetable crisper) would go perfectly in a quick braise with the drumsticks (heck, those dates would even be nice in this Moroccan-inspired dish). And this whole thing will be easy: toss the chicken with some spices and a light dusting of flour, sear the drumsticks in a heavy-based pot, add a splash of chicken broth, some olives, and orange segments, and cook until the chicken becomes tender and the flavors marry. Serve over couscous with something green; I don’t see any vegetables kicking around your fridge, though some diced butternut squash, canned artichokes, or even canned white beans could play the good-for-you role in this braise. Equipment: Large, heavy-based pot (like a Dutch oven), wooden spoon, cutting board, chef’s knife, tongs, shallow bowl, small bowl. How to do it: Season the chicken: In a small bowl, mix some kosher salt (1 1/2 tsp.) with ground cumin (2 tsp. ), chile powder (1 tsp. ), cinnamon (1/4 tsp. ), black pepper (1/2 tsp.) and pimenton de la Vera or chipotle powder – optional – (about 1/4 tsp.). Toss this spice mix with the chicken (2 1/2 lb drumsticks or bone-in chicken). Then set 1/2 cup flour in a shallow bowl and dredge the chicken, shaking off any excess. Braise the chicken: Heat a splash of olive oil (about 2 Tbs.) in a heavy-based pot over medium-high heat until it’s shimmering hot, about 1 1/2 minutes. Carefully add the chicken (it should fit in a single layer, evenly spaced, or else sear the chicken in two batches) and cook, without touching, until the chicken starts to brown and easily release from the pan when you lift up a piece, 2 minutes. Flip (or roll the chicken over), reduce the heat to medium, and brown the other side as well. Transfer the chicken to a large plate, add another splash of olive oil to the pot (about 1 Tbs.) and 1 finely diced onion (about 1 cup), sprinkle lightly with salt (about 1/2 tsp. ), and cook, stirring occasionally, until the onion browns lightly and becomes tender, about 4 minutes. Add 2 1/2 cups chicken broth (or water), a splash of red wine vinegar (about 1 Tbs. ), and some brown sugar (about 2 tsp. ), raise the heat to high, and cook, stirring to incorporate any browned bits on the bottom of pot, until the mixture comes to a boil. Reduce the heat to a gentle simmer (about medium low), return the chicken to the pot (this would be the place to add a 15-oz. can of artichoke hearts or white beans or some diced butternut squash), cover, and cook until the chicken becomes tender and cooks through (slice open into a thicker piece to check), 20 minutes. Segment the orange and finish the braise: While the braise is cooking, cut those 2 oranges into segments (check out this video from my friends at Fine Cooking to see how) or just peel and dice the oranges if you’re in a hurry. Add the segments as well as any juice from the orange peels (there will be some if you segment the fruit) and 1 cup olives. Cook for a minute or two so the orange heats through and it infuses the broth. Season the broth with salt and pepper to taste as well as a splash of red wine vinegar if it needs a little punch. Sprinkle with some fresh cilantro (if you have) and serve with couscous.